Judith Anne Gossett, went home to be with Jesus Christ 1:00 PM, December 11, 2003 in Surrey, British Columbia, Canada. Singer, recording artist, composer, producer, author, ordained minister of the gospel. Judy has worked closely with many in the recording industry including Andrae Crouch, Dony & Reba McGuire, and even involved in projects with secular musicians like Michael Jackson. The first album she produced ( for Sandra Crouch ) won a Grammy for Best Produced Album of the year. As an ordained minister of the gospel Judy travelled extensively frequently ministering with a strong prophetic anointing. She had a tremendous heart of compassion for the lost. From a very young age she often accompanied her fathers' ( Don Gossett ) ministry trips to India, and in her later years was very involved in organising her fathers ministry. Don's ministry trips to India have drawn crowds in excess of 100,000 people despite intense political and religious persecution towards foreign missionaries in India during those times. Thousands have been saved and many miraculous healings reported under Don's ministry. We first were introduced to Judy through her Father, Don Gossett during one of his visits to New Zealand. Judy felt the Lord prompt her to visit New Zealand saying she saw a vision and that the Lord had a purpose in her coming. Since that time our church has had several visits from Judy, and her influence has been life-changing. Judy came into our lives like a gentle tornado. She uprooted anything that stood in the way of the Father's purposes. For me personally Judy redirected my life's purpose and passion in such a powerful way. She was the instrument God used to turn my heart back to The Secret Place. During one of her visits I had such a remarkable encounter with the Lord that afterwards I was unable to speak for 7 days. During this 7 day period I received some marvellous revelation on Ezekiel's wheels. As a result of Judy's influence in our lives personally and the changes that were wrought in the church as a whole, we felt a definite call from God to change the focus and emphasis of the church and to commemorate this by changing the name of the church from "Joy Christian Fellowship" to "Pursuit". Judy was to be the officiating guest minister at our new church's opening ceremony on 22nd February, 2004, before her untimely death. We are left quite suddenly with no spiritual mentor in this great pursuit of our lover and bridegroom Jesus. Judy, you left without saying goodbye. Our entire church grieves your loss, and our nation owes you a great debt. There are many pastors here that hold you in such high esteem, your work here had just begun. Your loss is beyond words. Yet even in leaving us, your influence in our lives continues. Your untimely passing has produced such a resolve in our hearts to run the race and fulfil the call of God on our lives, that even in death you bring life. Till we gather together around the throne, may we all take heart that many have run before us, and we must redeem whatever time is left. To Him be all the praise and honour. 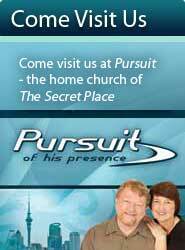 Ray and his wife Pam pastor Pursuit church in Auckland, New Zealand, a Christian charismatic Bethel church.